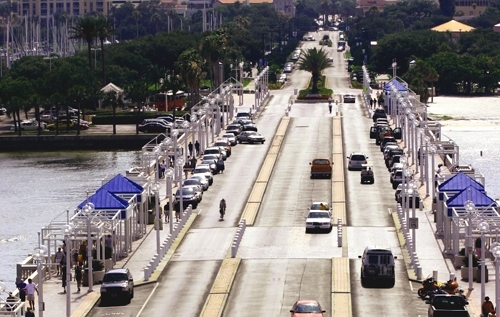 Morning travels quietly over the streets of St. Petersburg, Florida, bathing it in sunshine. Doors and windows unlock, opening the eyes of the city. At first glance, the town looks quaint, even quiet. But look again because there are numerous places to go and things to do. Begin your day in St. Pete, as the locals refer to it, at the top of The Pier, a shopping and dining experience found at the east end of 2nd Avenue North. Cha Cha Coconuts serves up fine Caribbean fare for breakfast or lunch while overlooking Tampa Bay and St. Pete Marina’s Central Yacht Basin. You might even spot a pod of dolphins swimming below. After breakfast, spend some time in the eclectic mix of shops located on the Pier where you’ll find souvenirs and novelties to your heart’s content. Or head to the Pier Aquarium and learn about local marine life. Later, take the free trolley to Beach Drive and check out some of the local museums, such as the Salvador Dali Museum, which overlooks Bayboro Harbor. Allow a couple of hours to immerse yourself in the works of a visionary, or follow the docent guided tour to learn about Dali’s use of symbolism and the hidden meanings of his work. You’ll find treasures like the Telephone Lobster sculpture as well as a painting believed to be Dali’s work at the tender age of six. Experience the double imagery that pervades Dali’s painting during his surreal period that also encompasses his best-known work. It’s hard not to come to more than one interpretation when reviewing this master’s work. Another museum worth a visit is The Museum of Fine Art, located on Beach Drive overlooking South Straub Park, has been home to such exhibits as blown glass artist Dale Chihuly and offers a permanent collection of Monet and Renoir. Wander through its 20 galleries, browse the continuing collections or take in the current exhibits that range in diversity from art work from India and Tibet to rarely seen museum collection pieces. The Florida Holocaust Museum honors the memory of millions of innocent men, women, and children who suffered or died in the Holocaust. One of the largest holocaust museums in the nation, it houses newspaper clippings, propaganda and clothing worn by the Jews. Stand in awe and sorrow in front of an authentic box car used to transport men, women and children to concentration camps. An upstairs gallery features exhibits changing throughout the year. For lunch, make your way to Central Avenue, the heart of St. Pete, and head to Fortunato’s Italian Restaurant for a slice of pizza and a beer, or check out Central Cigars for a smoke and a martini, if that’s your inclination. Of course, Starbucks is right around the corner for coffee and pastries. Art galleries are also on tap in St. Pete, including Second Saturday Gallery Walk, held the second Saturday of every month, and showcases local galleries and their artists. Sip wine and nibble cheese while visiting galleries and meeting artists and watching live art demonstrations. If you don’t happen to be there for this event, visit the Glass Canvas, showcasing sculptures, vases, perfumes, platters, paperweights and glass fish. Red Cloud Indian Arts Gallery, first opened in 1988, is also worth a visit, and has been presenting the finest works, created exclusively by artists working in the Spirit of the Native Americans, for more than 13 years. After a full day of absorbing the local art experience, head to BayWalk on First Avenue North. Consisting of two floors of palm treed, tiled beauty, BayWalk is a shopping and dining experience. For dinner, try Grazzis for Italian, Toojays for gourmet deli or drop into Dan Marino’s Martini Bar and stay for a Hurricane (a rum and fruit juice combo that’s tastier and safer than the real thing). Once that Florida sun starts to sink in the sky, make your way to Straub Park and catch one of the city’s outdoor events, such as one of the frequent concerts and art shows that take place. Or wander over to one of the benches and watch the sun drop: Florida’s sunsets rarely disappoint. From breakfast by the bay to sunset in the park, you’re sure to find enough to do to fill your time in St. Petersburg. This lovely city that holds more than first meets the eye. Previous post Tampa's SoHo Nightlife: It's Not About Ybor Anymore! Diana Reed is a writer/photographer living on the West Coast of Florida. She has been a professional photographer for ten years and has been writing since childhood. Her work has been published in Country Business, Coastal Living and Florida Catholic. http://dianareed.net.